Ravishing names for adventurous train journeys. And of course, as a head-over-heels-happy-traveler you already have a rough idea of where these steel constructions will take you – or you are dreaming, just as I did, of how they’ll transport you to faraway places. I can tell you, it is amazing and there are so many reasons to do this as I’ve told you all about here. But what are the differences? And which route suits you best? Read on, my fierce friend! Bief lesson in history. The Trans-Siberian Railway. It is the railway from Moscow to Vladivostok as devised by Tsar Alexander III in 1891. By 1916 the Russians completed the railway and it was completely accessible by train. In 1903 the first passenger trains already departed Moscow but at that time those adventurers had to cross Lake Baikal by ferry. Something we nowadays do not have to do anymore – although definitely sign me up for that journey. Where you often will hear – also from my mouth – that people travel with the Trans-Siberian Express, it actually means that they travel over the Trans Siberian Railway. And there are several routes to choose from, meaning that it has something for everyone. Totally up my alley – and of course up yours. The classic. The one and only original. The inspiration for the others. The route that covers the entire railway of 9288 km. The route that crosses Siberia in its totality (along the Chinese border) to final destination Vladivostok. And all that without leaving Russia. Let yourself be overwhelmed by the grandeur of Russia, by the vast nature and cities that are barely known in Europe. Get off at one of the dozens of stops including Nizhny Novgorod, Yekaterinburg, Omsk, Novosibirsk, Irkutsk near Lake Baikal, Ulan-Ude and Khabarovsk – all you need to do is practice your pronunciation. And the train in which you’ll travel? The Rossija. It is the best known train that covers the distance and is seen as THE original Trans-Siberian Express. And with it, you’ll complete the entire route in six days. So are you a go-getter? Someone who always wants to jump the highest, dive the deepest and travel the farthest? Do you like bucket lists? Then this route is for you. Because once you have taken the Trans Siberian Express, you can officially say that you have just made the longest uninterrupted train journey in the world. So cross that off of your list! Stare at the colorful Saint Basil’s Cathedral, sleep in a traditional ger (also called ‘yurt’) to experience what it literally means to be in the middle of nowhere and marvel at the size of the Tiananmen Square. Three countries for the price of one: Russia, Mongolia and China! From Moscow the train travels as far as Lake Baikal in Siberia, before heading south to cross the border with Mongolia at Nauskhi, right through the Gobi Desert (see the photo journal of the Gobi) to final stop Beijng. That is 7826 km of being glued to the window, I can tell you. It is the route that I have traveled and a journey that I will never ever forget about. So expect many more stories about its awesomeness. Because they must be shared. Are you a country collector? Do you want to see the landscape change drastically? Can’t you wait to toast with Russians, listen to stories about Mongolian conquests and try to decipher conversations from the Chinese? Then this is your route. ‘Huppakee’ as we say in Dutch! Another route that starts in Moscow and ends in Beijing, but this time you’ll enter China directly from Russia. And that means many Chinese passengers with fully loaded bags and fewer tourists – I’ve been told. It’s an older, slightly longer route that takes about six days and where you will feel 8984 km of tracks bouncing underneath you. Up to Lake Baikal, the train trundles along the Trans-Siberian railway and then crosses via border station Zabaykalsk to the Chinese province of Manchuria. Manchuria is the gigantic area in the ​​north-eastern part of China, where the major powers Russia, China and Japan have fought for centuries. Possible stops are Chita, Harbin, Shenyang, Shanhaiguan and Tianjin. It gives you the possibility to travel with a train that bares a name almost as strong as The Rossija: the Vostok. In other words: the ‘snelle-jelle’ – I can’t constrain myself with the Dutch – train that covers the distance at once. Do you like a local-feeling when you travel? Are you not interested in ticking-off highlights and have you always been curious about North-East China? Then try this route. An unusual route taken by few Westerners. The BAM starts again – surprise, surprise – in Moscow and ends in Vladivostok (so you’ll stay within Russia again), but this time the train takes the northern route through Siberia. 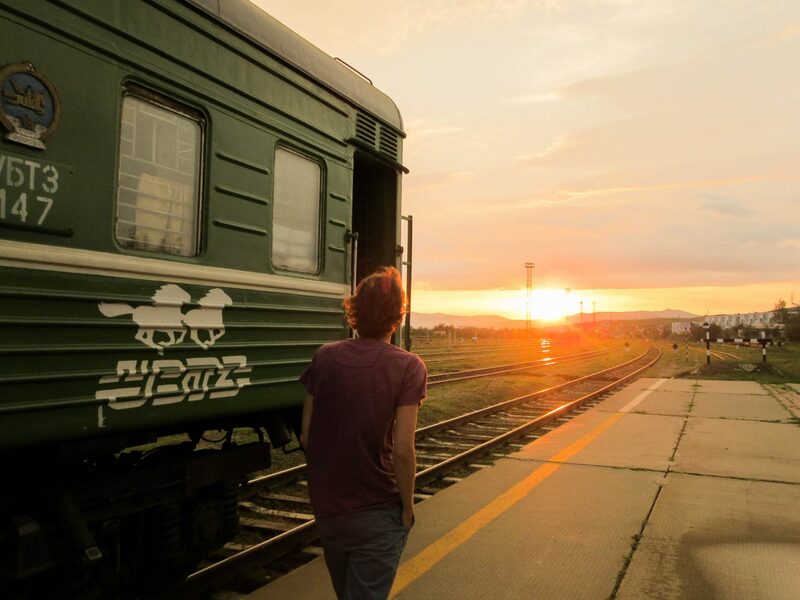 From Tayshet, the BAM Express departs from the original Trans-Siberian railway, to explore the BAM route and to travel through northern Siberia via the northern side of Lake Baikal. And it is a remote area. An area with lots of mountains, bridges and tunnels. Construction started in 1930, but was only completed in 1991 (!). Not many tourists take this route. All the more reason to make the trip at least once. So is it adventure that leads your way? Do you enjoy expansive views and do you love to explore remote areas? Take the daredevil route and jump aboard the BAM . Place of departure | All journeys begin at Yaroslavsky station in Moscow. Same route | The routes mentioned above all cover the same route for the first 4000 km. All of them – except for the BAM that branches northward at Tayshet – they’ll travel to Ulan-Ude (just after Lake Baikal). From Ulan-Ude they all go in a different direction. Departure times | Some trains – such as the Trans Mongolian Express that goes directly to Beijing – only depart once a week. But because the trains partly travel along the same route, you can combine trains. For instance, it may be a good idea to travel from Moscow to Irkutsk near Lake Baikal with the Rossija train, and to switch there to ‘the’ Trans Mongolian Express. On the website of the Russian Railways you can find the departure times and days of the trains. You can take a look all the stops of your chosen route, see how the train compartments are organized and which seats and beds are still available. If you want a global overview of departure times, then have a look at Seat61 where you will find an – somewhat overwhelming – overview. 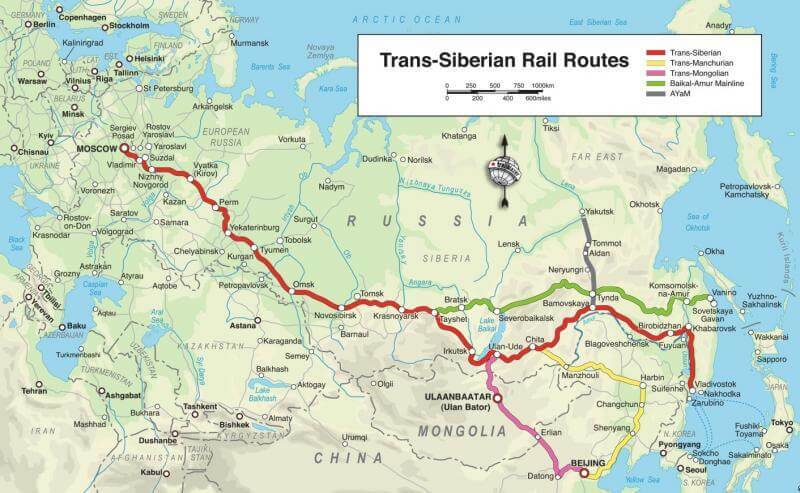 Have you taken one of the above-mentioned routes or are you about to join the selective group of Trans Siberian railway passengers?